elobeatlesforever: Ticket to a Magical Mystery Ride! Ticket to a Magical Mystery Ride! Hello ... Hello ... my old friends ... It's great to see you once again! Today I would like to highlight a marvellous amateur dramatic production that we witnessed today over in Llanymynech on the Welsh/English border. 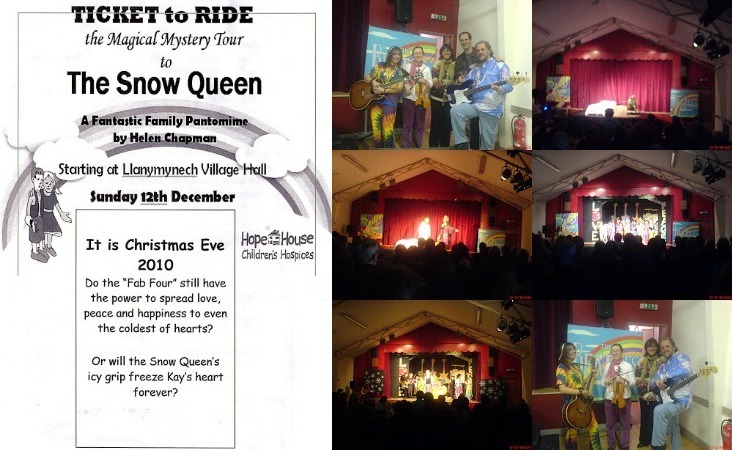 The Role Play Theatre Workshop presented a fantastic Beatles based pantomime entitled TICKET to RIDE: the Magical Mystery Tour to The Snow Queen by Helen Chapman. This production was in aid of Hope House Children's Hospices with the goal of raising a cool £1,000.